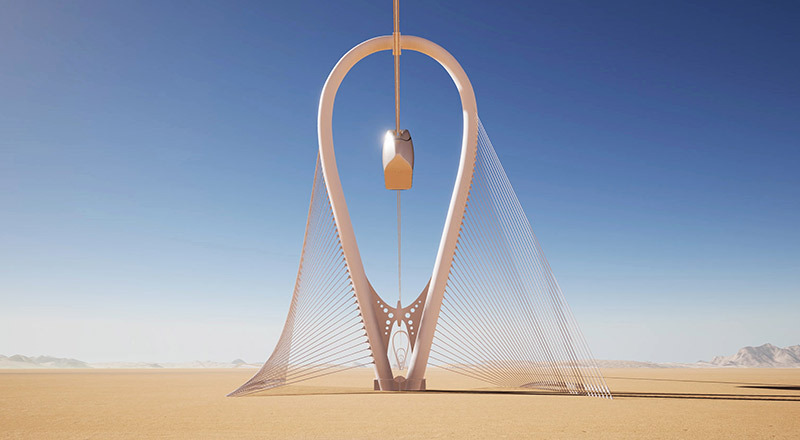 Under the leadership of Anatoly Yunitskiy, General designer of SkyWay Technologies Co., the Company's professionals carry out a unique complex work as part of a SkyWay transport construction project project on string transport at Sharjah Innovative Research Technology Park (the UAE), which has already earned the glory of the Silicon Valley in the Middle East. The entire SkyWay transport and infrastructure complex will be presented in this emirate, but today we will focus only on rolling stock by examining the first of its eight types, which will be ready for operation in the tropics in the very near future. You will find out everything else from an interview with Andrey Zaitsev, Head of the rolling stock Department at SkyWay Technologies Co.
Mikhail Kirichenko: We continue reporting on the work conducted by professionals of SkyWay Technologies Co. under the leadership of General designer Anatoly Yunitskiy, as part of SkyWay transport construction project at Sharjah Innovative Research Technology Park in the United Arab Emirates. Hello! Here is Mikhail Kirichenko with you. You are watching SkyWay news, where we report on the developments and implementation of breakthrough transport technologies. My today's interlocutor is Andrey Zaitsev, Director of rolling stock Department, who will tell us how the rolling stock is being prepared for operation under tropical conditions. Good day, Andrey! M.K. : Well, we have actually started the story. What is it behind us? Where will this transport go? Tell us please. A.Z. : We are standing on the background of a tropical unicar. This is the next model of rolling stock. The next in historical terms. The first model that will be delivered to the Middle East, namely to the United Arab Emirates. M.K. : Are you remaking the unicar that we already know very well or is it an absolutely new vehicle? A.Z. : Honestly speaking, they have only the name in common, because when we adopt technology to some other climatic conditions of operation, it is always a great deal of work. If a conventional vehicle, even a sample of series production, is transferred into some other design, it will get 3040% of changes in its structure or manufacturing technology. If we take our vehicle, this percentage was considerably more. Of course, we have combined the adaptation to tropical climatic design with certain improvements in its configuration, therefore, it is a completely new pod for us. We have partially used the same units from the series pattern. For example, the motors, though their features were slightly improved for operation at 50 °C and higher. M.K. : And how much time does it take to design a new vehicle, if we compare with the automobile industry? A.Z. : Well, what do you think, Mikhail? M.K. : Perhaps, at least several months or even years. A.Z. : Years? If we have been designing it for years, other people would do it instead of us. But if we compare it with the classical automobile industry, I think we are doing it at least twice faster. Developing of a standard car to the stage of a pilot sample takes minimum 9 months. Then the pilot sample passes running tests, certification, etc. It may be ready for mass production in about 2 years. In our case the decision to start working in the Emirates was announced at EcoFest 2018, in early August. Only since then we have started to work out this vehicle. M.K. : But we started it not from scratch, from nothing, but from an existing vehicle. A.Z. : Of course, firstly, we had already certain experience. Secondly, I can say we have created a new model, but in the same class, using certain solutions that were worked out and repeated. However, if we are doing a new vehicle, we have to design it from the first screw to the last one, because the structure should form up in a single whole. Speaking again about the terms, since the start of designing we have passed through August, September, October, November  4 months. We began manufacturing it in December. It is mid-January now and we are standing near almost assembled pod. It will be finished in late January and dispatched to running test. It is 6 months in total and the vehicle will be riding performance trials. M.K. : How complicated is this vehicle compared to a conventional car? A.Z. : What should I say? We can often hear word combinations "usual car", "standard car" or "classical car". It is a structure with a definite design: motor, car body, wheels, shock damper. But here the technology is absolutely new, therefore it is complicated already due to this fact, because it doesn't have a previous stage of development. We worked it out from scratch directly to the stage of a product. I wouldn't like to do any particular comparison so as not to look dishonest, but our vehicle is much more complicated than a conventional car. M.K. : Moreover, we have there an automated control system and computer vision. A.Z. : Thank you for reminding. I kept in mind only the mechanical part, but there is also a control system in it, which was also included in those development stages and that term. M.K. : Yes, your achievements are quite impressive. I hope we shall be able to show how it all moves under tropical conditions. Not only in Belarus, where we have seen it many times, but also in the Emirates. A.Z. : Of course, but since we have the first test site in Belarus, we will have an additional challenge to test a tropical vehicle here under Belarussian winter conditions. And we will do it. M.K. : Tell us please what other next pods will follow this unicar in tropical version for that region? A.Z. : We have a program to produce about 8 vehicles for that region. I say "about", because we work so dynamically while implementing a large project, we divide it into separate parts, because one of them may be replaced, improved or changed. Therefore, it is about 8 vehicles so far. They will be for all types of transportation  from passenger services starting from small capacities, like in the unicar, to unibuses of large capacity (articulated trains for 200300 people). We'll also have cargo haulage, like unicont  a vehicle for sea container transportation, in mounted and suspended versions. Cargo unitrucks of 25-ton gross weight, a high-speed pod, too. I have to check up with the schedules, there are many of them there. I cannot recall all of them now. M.K. : Thank you very much. Sorry for detaining you from your work. Please return to your main activities. Thank you for the interview. Sign up to our YouTube channel. Follow the news update at our official website. Support our project. And you will have tropics at home even in cold winter. BUILD SKYWAY  SAVE THE PLANET!